Kobe beef burger with bacon and housemade pimento cheese. There are three per order. These are almost impeccably prepared and we were so impressed with it that we were practically fighting over the third one! 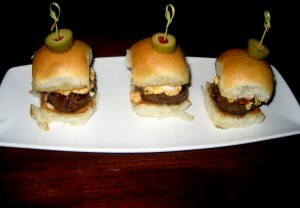 The beef was tender and flavorful, the bun was soft and buttery, and the pimiento cheese complemented it well. The bacon flavor didn’t really come through, but it would have been perfect if they added a little more. These are quite a bargain during happy hour! 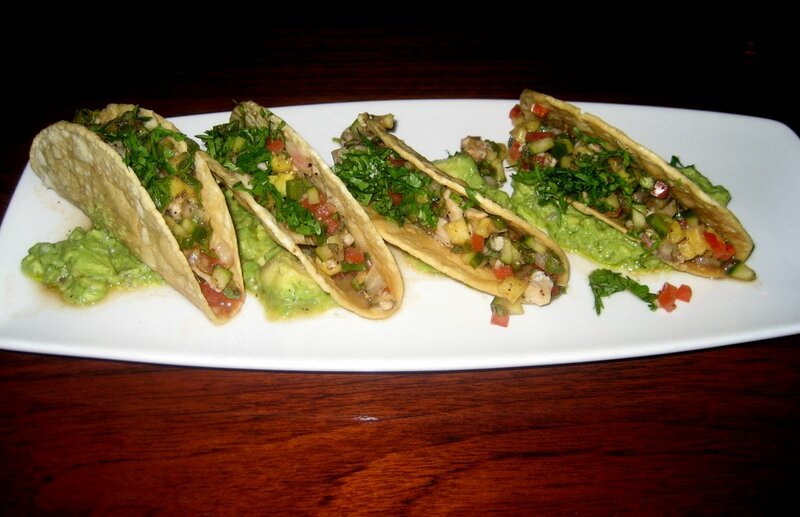 Hard shell tacos stuffed with white fish, shrimp, lime & lemon juice, cucumber, pineapple, tomatoes, shallots, cilantro served on a bed of guacamole. There are four per order. A burst of freshness on these hot summer nights. It was a good quality fish and a Truluck’s gives a decent amount too. All the stuffings were fun and tasted great inside the crispy taco shell. It was a little sour because it was over juiced with the lemons and limes. The sweetness of the pineapples and creamy guacamole helped counteract the tartness. 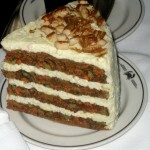 Overall, this is another yummy appetizer. 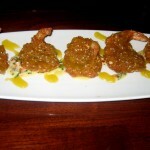 Fried shrimp with mango sauce. Again, we were pleased by the amount of shrimp that came out – five per order. 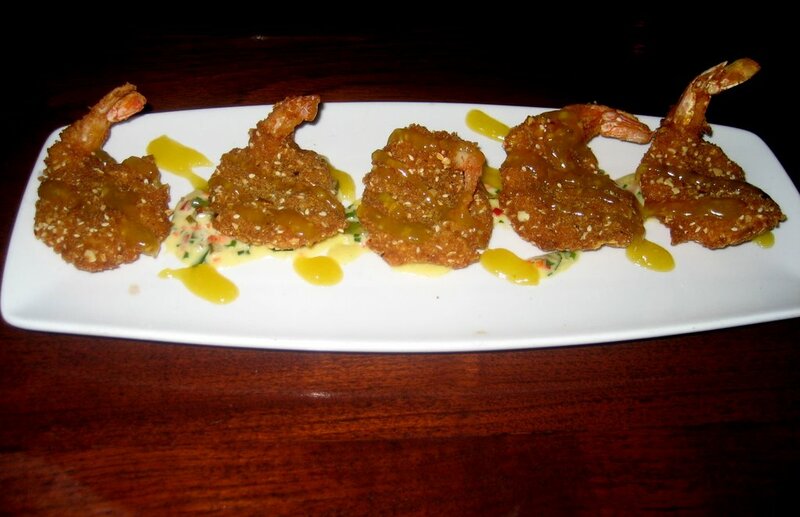 The shrimp were crispy and somewhat chewy – perhaps because they were over-fried. Other than that, it tasted pretty good with the mango sauce and the other creamy white sauce that the shrimp rested on. There were so many appetizers to choose from on the happy hour menu, so we may try another one next time. 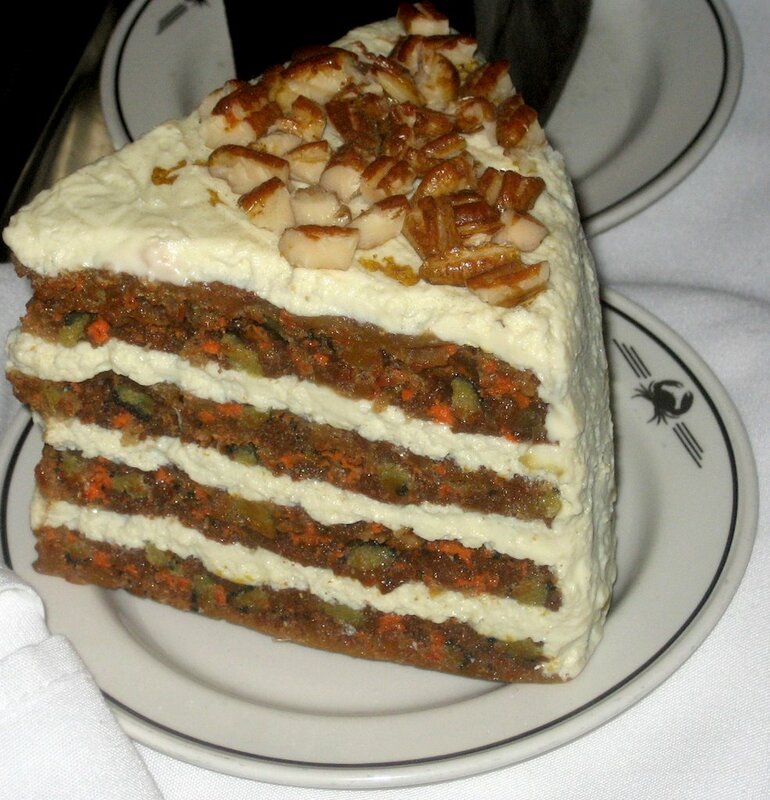 Rich and moist, with fresh carrots, crushed pineapple, cinnamon and pecans, layered with cream cheese icing and with warm butterscotch sauce on the side. Sinfully delicious!! They gave us a generous slice of cake and we were overcome with emotion at how scrumptious it tasted. So moist and cinnamon-y flavored – it didn’t even need the butterscotch sauce. But the warm sauce just made it that much better! We were tempted to lick our plates clean. Truluck’s is located in the Arboretum. Parking is not a problem since it is a large shopping area. The interior has a very romantic, classy but comfortable feel, with dark wood paneling, dim lighting, gorgeous bar area, and a talented pianist who interchanges between playing old favorites such as Sinatra with more modern pieces. There is dining room seating, a happy hour area, and bar seating. 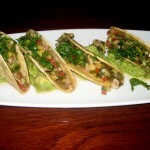 This restaurant would be suitable for a casual, special occasion, or business dinners. Remember that Truluck’s specialty of course is their seafood, but they are also reputed to have great steaks and offer over 100 wines by the glass. We really enjoy Truluck’s and suggest you give either the Arboretum or the downtown location a chance to turn you into a loyal patron!